William Hull was born on 2 May 1795, the son of glover and breeches-maker William Hull and his wife Ann. William's baptism appears in the Yeovil Independent Church Register of Baptisms on 25 December 1805. That William and Ann were recent converts to Nonconformism is hinted at by the fact that on the same day as William's baptism, his siblings were also baptised - John (born 8 May 1798), Flora (born 7 October 1800), Sarah (born 2 November 1801) and Henry (born 23 March 1805). William's daughter Flora was to marry John Pickford, a Quaker, and the baptism of their son John Jnr is recorded in the Quaker Baptism Register. William's father, William Snr, was glove manufacturer and was recorded as a glover on 21 May 1791 taking on Morgan Seamer as an apprentice and on 7 July 1806 he was listed as a glover and breeches maker when he took on John Jones as an apprentice. With regard to William Jnr however, I was unable to find any further records although it is known that he was a glove manufacturer in Yeovil and died in 1865. William's main claim to fame is that in 1834 he published his 144-page book "The History of the Glove Trade" written while lying on, in his own words "a bed of sickness, to which he was confined for many weeks, utterly incapable of attending to the ordinary affairs of life". 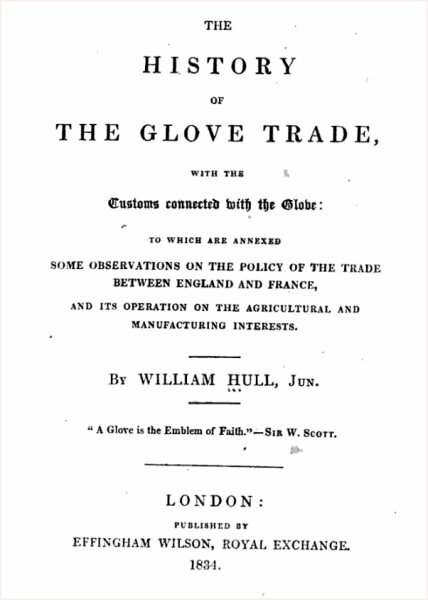 In this work he covers the origin and antiquity of the glove, customs concerning gloves including a whole range of different glove types, his summation of the past and present state of the glove trade across the country and abroad, and finally makes his extensive observations (somewhat biased) on the trade between England and France that he maintained was to the extreme detriment of the English gloving industry. "The town of Yeovil, formerly much celebrated for its manufactures of dowlas, ticks, &c, has for nearly three centuries been so for the manufacture of gloves of the finer kinds, as well as military gloves. The latter is now in a state of decay, partly owing to improvident alterations in the military supply. These gloves are made from native skins. Imitation "Limerick" and "York tan gloves" were formerly made in Yeovil, but of late years very few. At present the manufacturers are employed in making men's and women's fine gloves, which pass in the retail shops under the denomination of kid gloves, but are, in reality, made from lamb-skins, imported from Italy, Spain, and Germany. These skins are mostly dressed into leather in Yeovil, in which place the manufacturers are leather-dressers, and large dealers in wool, as well as Glovers. The great importation of French gloves annually, is a complete check to the prosperity of the trade of this place; because, the moment that the Glovers, by reducing the quantity produced, endeavour to gain a remunerating price, the wholesale dealers in London give increased orders to the French manufacturer, and thus neutralise the efforts of the native manufacturer. The making of gloves from foreign skins has, for several years (owing to the unnatural competition with France), been so unprofitable as to occasion repeated applications to Parliament for protection, — hitherto without success. The increasing value of wool has, for some time past, bettered the condition of the Yeovil trade. This, however, is only a temporary advantage, and in no way affects the question of the policy or impolicy of allowing foreign gloves to be imported. The non-remuneration of the Lamb Glove Trade in Yeovil has occasioned many of the manufacturers there, to become makers of kid gloves, in imitation of London-made gloves. The quantity of gloves made in Yeovil, of all sorts, may be estimated at 300,000 dozens annually; and the number of men, women and children employed in the place, and the adjoining districts (spreading over twenty miles), amounts, perhaps, to 20,000. The subjoined statement of poor-rates for the year prior to the introduction of the "free-trade," and the fifth year subsequent to that period, will speak for itself. A Ashford, John Batten Esq, Edmund Batten Esq, John Bide, Henry Barrett, William Bide, Thomas Cave, J Cox Jnr, Charles Caines, JM Cook, Samuel Duffett, Mr Dicks, P Edwards, J Edwards, Rev S Fawcett, Thomas Fooks, Mr Fitze, Mr Fairlamb, Messrs Greenham & Sons, Samuel Glyde Esq, B Glyde, G Glyde, F Geare, B Goodland, S Gregory, G Harbin of Newton House, Mrs Harbin of Newton House, Rev James Hooper of Hendford House, Messrs Hammond & Pickford, T Ham, Josiah Hanham, W Hull Snr, John Hull, E Hawkins, Rev J Jenkins, William Jennings, Rev Jukes, Samuel Kitson, WH Masters, Mr Marsh, T Mills, John Ryall Mayo, G Mayo Esq, E Newman Esq, Henry Penny Esq, B Phelps, Mr Porter (three copies), Mr Perratt, S Parkhouse, Thomas Ralls, William Rawlings, Mr Rossiter, FT Robins, B Ryall, John Slade Esq, John Stacey, W Sydenham, Mr Slade, T Shorland, T Samways, John Tomkins, H Treherne, William Tomkins Esq, James Tally Vining Esq, William Willmington, Henry Whitmarsh Esq, William Lambert White, HM Watts, George Wellington, Messrs W & E Whitby. William's baptism in the Yeovil Nonconformist Register of Baptisms on 25 December 1805. The frontispiece of William Hull's "History of the Glove Trade", 1834.